NEW! Spring Pre-K Storytime is now Bedtime Storytime at the Boscobel Library, March 6th thru April 24th. Join us with your littlest ones each Wednesday evenings from 6:00 to 6:30 pm. Kids wear your PJ's and bring your favorite stuffed animal and even a blanket! There will be sleepytime stories, finger plays and crafts to enjoy and get everyone ready for a good night's rest, adults included! We look forward to seeing everyone there. Library History Club Meets Thursday, March 7th at 6:30 pm. The History and maps/ layout of the old Boscobel Fairground between today's High School location and the southern end of Kronshage Park. When was the last fair held? Who exhibited there, what events, individuals and organizations were involved with the fair? Boscobel's GAR Hall History and Historical Collection; this important building, its founders and caretakers, and its contents are vital to our community's local history. The Crooked Creek and other One-Room Schoolhouses serving Boscobel, a project Nancy Rutherford from the Boscobel Depot Museum is working on. 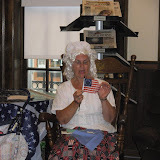 Planning a special Saturday History Club meeting for out of town Boscobel natives to come visit with their historical treasures and stories. We are looking at April 20th for the date; come to the meeting and help us plan! If you or someone you know has information, recollections, memorabilia or just plain curiosity about these subjects or other "points of interest" from Boscobel's long and rich history, come join us on the 7th for a fun and interesting visit and discussion as we work to pull stories from the past together for future generations. Please call the library with any questions or for further information, 608-375-5723.